Making Customers Happy AND Making Money Are Compatible! Let me show you and your organization HOW! I Didn't Cope with Tragedy, I Converted It! Let me tell your group HOW! If You Are Living, You Are Selling and I Wrote the Book on Sales! Let me teach your team HOW. As a Woman, I Have Navigated Many Pitfalls in the Most Male-Dominated Industry in Our World, the Car Business! Marion has been retained by dozens of educational bodies (i.e., University of Florida, Texas A & M University, Neeley School of Business @ Texas Christian University, etc. ), private businesses (i.e., DuPont, Dell, Shell Oil, Avon, etc.) . 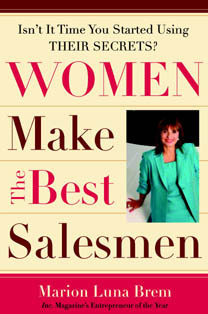 Marion Luna Brem is the author of two highly praised books, The 7 Greatest Truths About Successful Women (Penguin Putnam) and Women Make the Best Salesmen (Harper Collins). 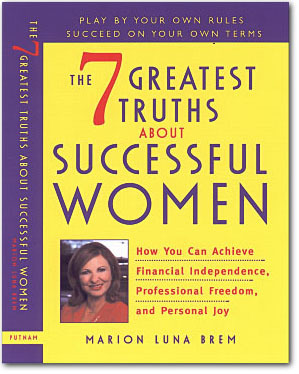 In her first book, she reveals the 7 attributes that are inherently available to any woman wanting to claim success. Marion Luna Brem founded Love Chrysler Plymouth in August 1989 in Corpus Christi, TX. With no facility, no equipment, no auto parts, no furnishings, no computers, no employees and no cars for sale, she had only the rights to the franchise which she purchased with her strong sales resume. "For Marion, failure was not an option." "Business phenomenon on the Gulf Coast of Texas." Here are a few of the subjects I can speak on at your next event. Click the button at the bottom to learn more. Choose to convert the down turns in your life instead of just coping with them. Don't be a Survivor, Be a Thriver! Reach your indomitable spirit even in the midst of tragedy. Overcome your fears with tears and yes, even laughter listening to this intimate account. "We were touched by her story, courage, and fortitude." Marion Luna Brem is the author of two highly praised books, The 7 Greatest Truths About Successful Women (Penguin Putnam) and Women Make the Best Salesmen (Harper Collins). "Albuquerque native triumphs over illness, setbacks." "Brave mom fights back against all odds." "Once desperate. Now she's in control." Selling her first car catapulted her to owning her first car dealership in less than five years! Inc. Magazine honored Marion with their “Entrepreneur of the Year” naming. Good Morning America traveled to her home to have her share her financial business tips with their audiences.